These projects will get you started on furnishing a miniature nursery for a baby doll. There are a range of items which can be made in several scales, just change the materials to suit your chosen scale. If you are making a nursery setting to showcase a particular collection of dolls or miniatures, choose your sightlines into the project in order to showcase your favorite items. Weave this delicate 'wicker' or lloyd loom baby basket from fine crochet cotton or quilting thread. You can make it any color to match your miniature nursery. 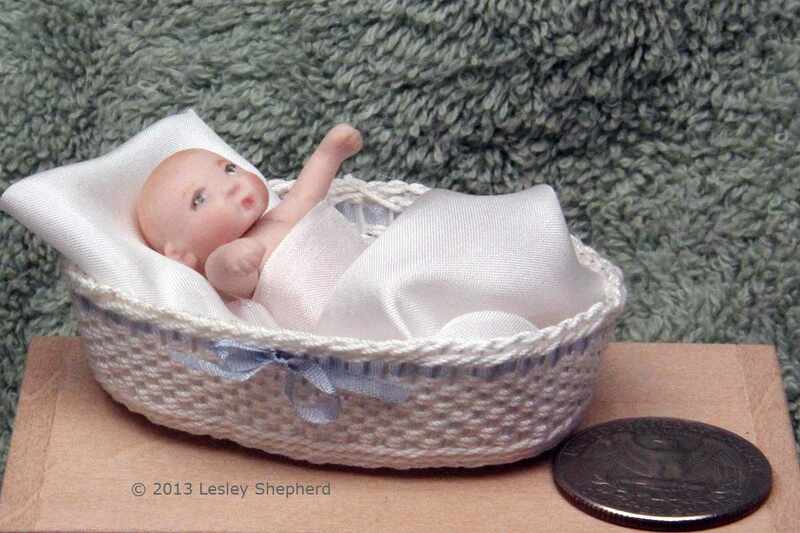 If you wish, use similar materials to weave a small oval basket to hold baby changing supplies or toys. The basket can be set on a table if you wish. This Moses basket or carry cot is made using a coil weaving technique which is easy to master. To replicate a traditional rush moses basket, we used raffia woven over fine wire to make the coils. For a coiled basket made from fabric, see the instructions for making the coiled rag basket. This wicker change table has shelves for storage and can be fitted with a small cushion on the top to co-ordinate with your nursery design. The table is relatively easy to weave, as long as you watch your tension! If you are a beginning weaver, use heavier crochet cotton. Miniature baby bottles and powder jars add to the effect of a realistic nursery. These are made from scraps of craft wood or plastic, as well as air dry or polymer clay. This removable sleeper is shown fitted to a 1:12 scale porcelain doll. Find fine knits suitable for the size of your doll, and use doll velcro to make small low profile closures that don't detract from the effect of the sleeper. The same pattern can be used to make 'onesies' and baby shirts which cross in front. You can make a range of hooded towels for dollhouse babies and toddlers using inexpensive baby wash clothes from a dollar store. We've shown a piglet towel here, but the technique can be used for any animal with a snout. Try making puppy towels, frog towels, hippopotamus towels, with the same method and different shaped ears.